​We are one of the leading Antique Windup Phonograph Repair Shops in the nation. For over 25 years we have been servicing, repairing and sell phonographs, parts, and related accessories. “It all started with the inheritance of an Edison Diamond Disc S19 phonograph by the company’s founder and owner, Rod Lauman.” This phonograph was a part of Rod’s childhood and played often at his grandparents house. Rod and his cousins would put on skits while the music played. 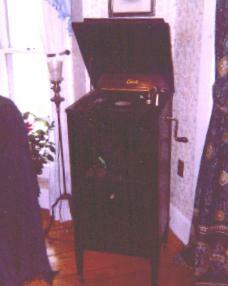 Rod inherited the phonograph shown to the left in 1975 from the family. Rod started by working on the Edison Diamond Disk and bringing back to full working order like the day it was bought. Soon he started collecting and repairing phonographs for himself and for customers locally in Vermont. Soon after that, Victrola Repair Service was born. Over the years the repairs grew from locally, to regionally, nationally and today Victrola Repair Service even does work internationally. Most of our work is done through the convenience of mail-order. We also welcome visitors to come by our shop when you’re in Northern Vermont (please call ahead to let us know you’re coming). The Edison Diamond Disc S19 has become one of the many pieces in the Victrola Repair Service Shop Collection. There are many other machines in the Collection along with many phonographs for sale which can be found on our Phonographs for Sale page. For more than 20 years Victrola Repair Service has been repairing phonographs for customers worldwide and is one of the nation’s leading windup phonograph outlets for repairs, parts, supplies, memorabilia and phonograph sales. Even though we have turned out thousands of repairs over the years, we still have not forgotten our New England traditions, rooted in honesty, hard work, and providing the highest quality of service for our customers. We are eager to take care of your phonograph needs and are open 9 AM until 5:00 PM (ET) Monday through Friday in order to best serve our customers. We can also be reached via phone at 802-748-4893 or 800-239-4188 or e-mail at Victrola@victrolarepairservice.com (we generally respond to email within an hour during our business hours). The shop supervisor is Rambler. He keeps a close eye on us at work. He will be the one to greet you should you stop by. Rambler was rescued from Kingdom Animal Shelter, where Rod Lauman is on the Board of Directors. If you would like to help out the cats that are still at the Shelter and not as lucky as Rambler to have a home, you can donate right on the Kingdom Animal Shelter site or you can add a donation on to your order or repair and Rod will make sure that it is delivered.